Hydric - We're an apps studio that specialises in building digital products and experiences people love. Any triple j fan will tell you, voting in the Hottest 100* is a glorious yet time-consuming tradition. It’s a great way of reflecting on the year of music that’s just been, as well as discovering songs that you might have missed along the way. But with so many available tracks to vote for, the process can be daunting. When many of us in the office realised that we were yet to cast our votes for the year, and with time running out, inspiration struck. 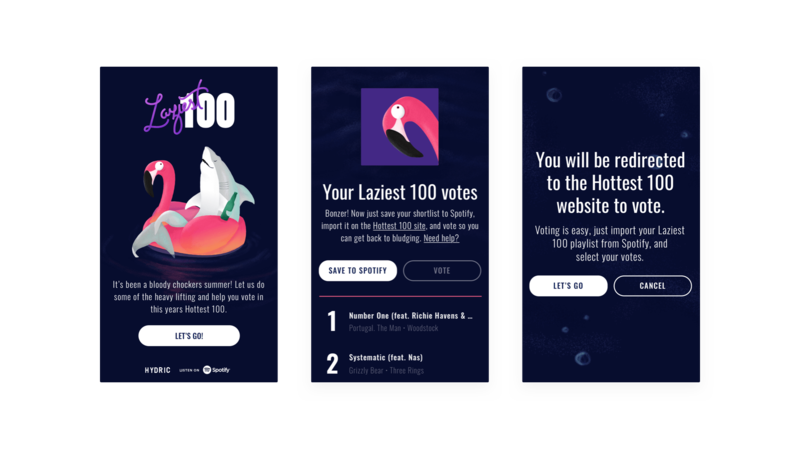 We created the Laziest 100, a web app that would save us, and other lazy voters, time and effort. 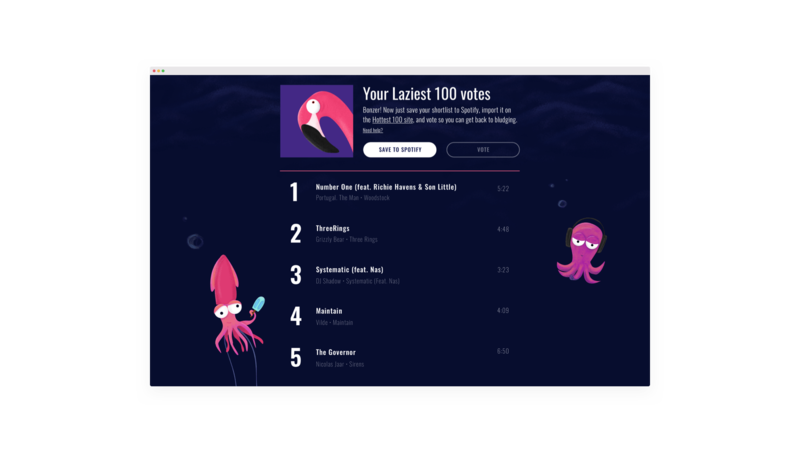 Using our years of experience with the Spotify API and playlist generation technology, we decided to create a playlist generator that compares a user’s Spotify listening history with the Hottest 100 voting list to create a voting playlist. Users can then use the Spotify integration already present on the triple j voting site to connect their account and import our playlist as a voting shortlist. Making the whole experience tick is an internal Hydric tool called Lineup. Our developers ingest the list of tracks up for nomination into Lineup to handle song recommendation generation. Initially we tried loading the user’s top tracks and artists on Spotify to cross reference against the pool of triple j artists. However, this approach resulted in the generated playlists being less diverse than desired, even for the avid triple j fans within our testing pool. In order to boost the size and quality of these playlists, we broadened the track-matching parameters to include songs whose artists appeared in the user’s Spotify listening history. This gave users more options for voting whilst still returning relevant results. For those lacking in relevant hits, we added some taste-based recommendations from Lineup to ensure that even those not up to date with the previous year’s music would get a quality playlist. Once users get their playlist, they can save it to their Spotify account and then import it directly into the triple j voting system. The result is an experience that shrinks the voting process, which may ordinarily take hours, down to a few minutes. We were so stoked with how the first Laziest 100 turned out, we committed to updating it on an annual basis. 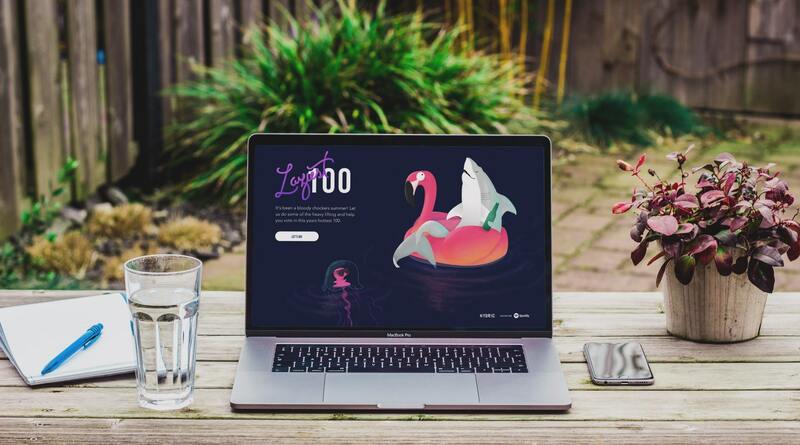 Each year we tap into our design team’s impressive illustration skills for a design refresh, always keeping the theme of the traditional Australian Hottest 100 gathering. We also tweak a few things under the bonnet to make sure it runs smoothly every year. We can’t wait to revisit it next year for an even bigger, better, and lazier Hottest 100. *For our international readers, triple j is an Australian radio station that hosts an annual music poll of tracks released and played by the station in the previous 12 months. The top 100 tracks voted for in this process are then broadcast in a countdown. It has become so popular that listening parties are held around the world and millions cast their vote each year. Drop us a line, we'd love to hear about what you're working on.